Some manufacturers offer wooden rung ladders, slippery powder coated pipe or vertical ladders which can be hard to climb. This inclined stepladder is very strong and will help your child develop confidence in his/her climbing abilities. My build it yourself plans teach you to use 2”x 4” uprights and 2” x 4” supports laminated together make an extra heavy-duty ladder. 2” x 6” steps provide a wide step-up into fort and the ladder is inclined at 30 degrees so you're more likely to lean forward as you climb. 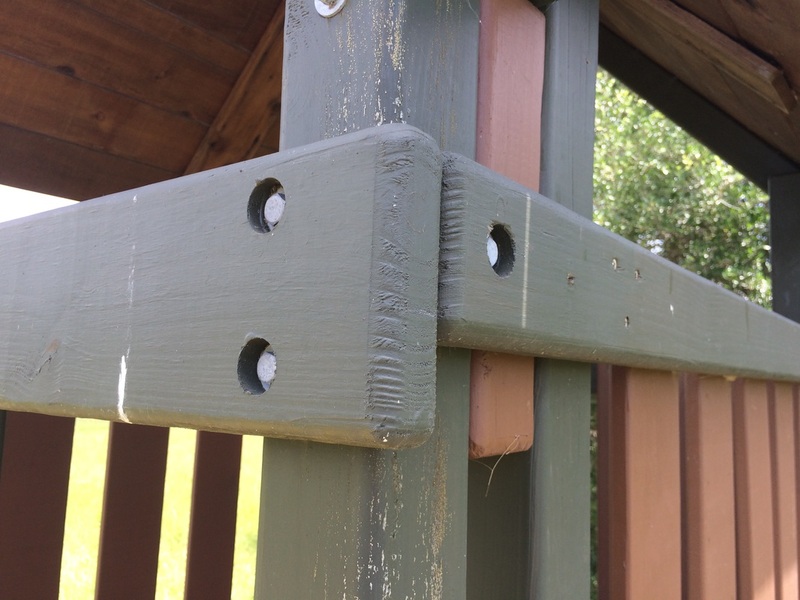 Overlapping joints at the base and at the top of your structure add strength, durability and overall stability to your playset. 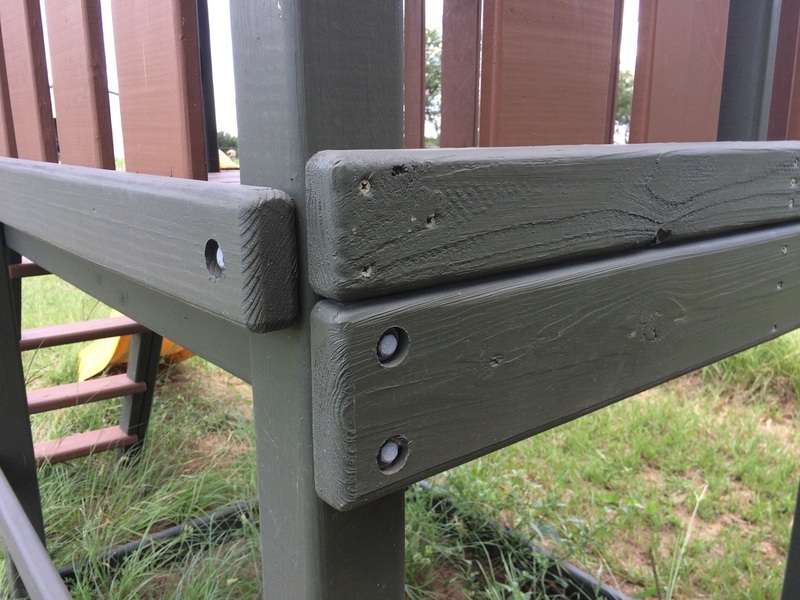 Counterbores recess heads of bolts to minimize snag hazards and give an the playscape and overall look of quality and craftsmanship. These wood-on-wood features along with the double bolt construction help make the forts adult and kid safe. Two 3/8” lag bolts are used at all 2” x 6” to 4" x 4" joints. This eliminates pivot points in the structure, minimizes leaning, and adds overall strength. There are 4) deck supports with 2" x 6" planks for the deck. Rounding all corners and edges to eliminate sharp corners or edges is not necessary but it is recommended and worth the extra effort. The wood in these pics have been coated with a sealant. 3” screws and 3/8" lag screws are utilized at all 2” x 4” joints. This eliminates a pivot point in the structure, minimizes leaning, and adds overall strength. Pre-drilling of all holes before securing minimizes cracking and splintering of the wood. Notice no splits from fastener attachment and all corners and edges are flush and square. 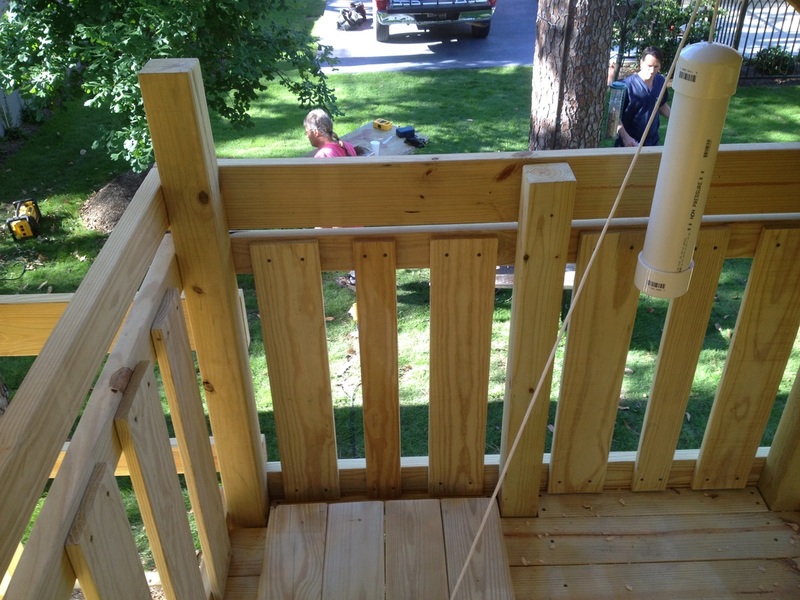 Your friends will think you spent a fortune on your backyard playset. Fastened with screws, not brads or nails. Solid rail system is set with all openings 3” or less eliminating entrapment areas and providing a high level of comfort and relative safety. The rail uprights are on the inside of the fort, not outside, where they can be pushed out. All upper level sides of my playset designs are enclosed unless there is a play event at the opening. This all-wood a-frame assembly is built to support any load your kids can dish out. 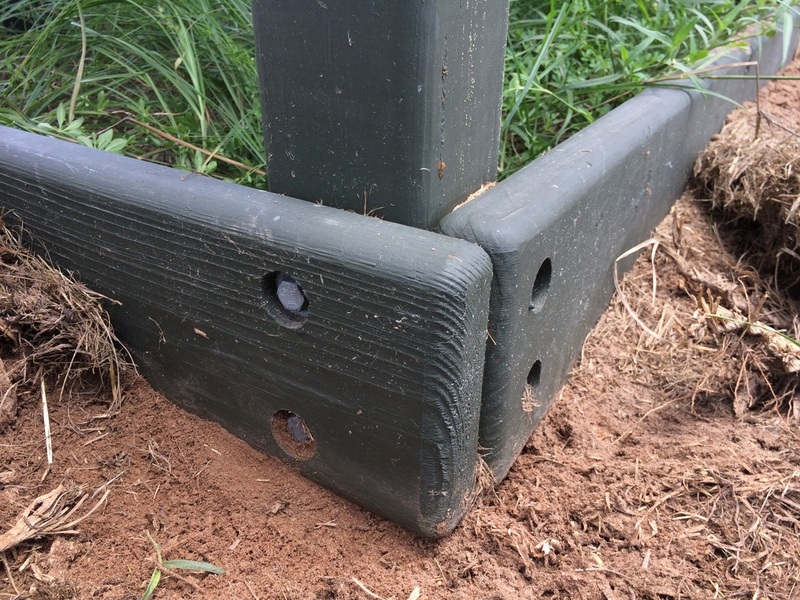 Solid 4” x 4” legs and support blocks are secured together using ½” bolt thru beam carriage bolts along with 3/8" lag screws to lock down the top of a-frame support. The spread of the legs is greater than the height of the swing beam and the a-frame legs are staked to the ground to add increased strength and stability. Don’t rely on flimsy powder coated metal plates to mount the swings to the fort. MY design utilizes wooden 4” x 4” blocks and ½” bolt thru beam carriage bolts and 3/8" lag screws to secure swing beam to fort. When you see this, you will not doubt the strength of this all wood swingset assembly. This design also allows some flexibility to adjust for sloped yards, backyards that are not completely level or height requirements. Don’t leave your investment behind. My design breaks down into several large parts that can easily be moved to your new home or sold for another family to enjoy. Make your playset from redwood or cedar and increase the value of your investment of money and time. Due to the over-whelming popularity of redwood playsets, resale value should be 50-75% of original cost. That's two Triton Playsets you see stacked on the trailer.